It's a common enough trope: It's always the nice ones. Because the DM's primary role is to surprise and create challenge, it's not hard to see why players are suspicious of things that seem to lack any obstacle or hostility. "Sure, let's roleplay job applications." Is that you, Digo??? Are we finally blessed with your dazzlingly radiant visage? How long may we bask in such forbidden glory? I pictured you with an avatar more like this, actually. Heh. My wife calls me Deeg. I'm sorry, Felithanderas the Destroyer of Towns, but we've found that your credentials are not adequate for the position of Head Butler. Your experience "defeating your enemy, seeing them driven before you and hearing the lamentations of their women" simply isn't applicable. We hope you understand. A Savage World's game I'm in is currently in the middle of an orientation for Earth's new Star Trek program. I have to wonder how my Rich Suave Cyborg ever got picked for the program, though, considering his choice of skills. Interviewer: So, Mr. Siegmund, have you any leadership experience whatsoever? Interviewer: Do you have any combat experience? Tristan: I'm decent with a pistol. Tristan: Hey, let's not count me out just yet. Look, I bet a beautiful lady like yourself deserves a break from dealing with the riffraff who desperately want to man Earth's first spaceship solely because it would make them famous, am I right? How about we continue this conversation over at that fine restraunt across the street. My treat. Rick the Engineer: $20 bucks?! I thought you said you were rich?! Isn't that like the entire theme for the better part of TF 2: Analysis Anarchy? I've never seen the TF2 Analysis Anarchy, so I don't know how it compares. In fact, I don't think I've ever played TF2 (despite the fact I believe I do own that game). I have watched most of the TF 2 stuff, and yeah, I guess? I am utterly surprised and bewildered that the GM did not leap at this opportunity to stall until the actual player got back. Whhhyyyyyyyyy??? Actually, he had soooo many chances to legitimately stall??!? Tell of a time when a GM or player could have utilized a perfectly legitimate in-story/in-game reason to justify out-of-game-extenuating-circumstances (had to brb, had to miss sessions, etc. ), but did not. What did he or she do instead? And was it ultimately a better or worse decision? Hmmm... hard to say as it used to be last-minute when players missed sessions. I remember one super-hero campaign I was in where the session ended in the team defeating a radiation-based villain. One player had to skip next week's session due to a doctor's appointment so the GM had him out sick with rad poisoning. PC turned up at the session anyway (appointment was rescheduled) and so he got to play a session of being in a hospital. Um... yay? My problem at present is that my campaigns (at work, with easily distracted teens) keep collapsing when some don't turn up. What I *should* have been doing is running sessions for the ones that did, even with new characters or NPCs, and using that to build the world around them. The basic theme is a semi-military trouble-shooting unit which lately has been on a long journey away from home, which meant it would be hard to play through the MAJOR revelation they had just discovered without the players. I considered having the no-shows get eaten by the dragon they'd met, but what (after it was too late) I decided to do next time is to revert to the city and give them a new party investigating the same sorts of things and then, if they stuck with the storyline, eventually have them investigate the disappearance of the first group. The group I'm GMing for haven't had a reason to actually not show up to a game (other then almost everyone not being available), but some always have a reason to decide to stop playing and go watch someone do something else half way through the session (because they're not always in the spotlight?). Depending on the situation in hand, I either sidelined their character (because I have an opportunity), or let another player control the character (because I couldn't be bothered to try). Thankfully, all of the players are my roommates, and anything that happens to a character is solely the GM's fault. Story time! Tell about a time when your group came up against something that seemed suspicious and/or paranoia-inducing, but turned out to be totally harmless after examination. Bonus points if the DM never intended the event or individual to appear suspicious, or if the examination involved retroactively unnecessary combat. "You see the shimmer of what appears to be an invisible, unarmed, unmanned drone." Reminded of a teammate who saw a roadside bomb before it detonated and thought driving into the explosion was the safer option than turning away from it. Wasn't a TPK, but no one got out of that fight uninjured. Wait a sec! It's not safer to drive into an explosion than to avoid it??? I thought explosions were like some sort of iceberg and cars have like super-armored frontals, so that taking the explosion head on IS better than swerving and taking it to the side?? Is this not the case??? Well, still a better plan then other things I've seen. "He has a goatee and a name! He must be evil!" Online Old World of Darkness mixed game (so, Shifters, Kuei-jin, Mages, and both Hsien and Western Changelings running around, sharing a site). I was running a scene where someone was given an envelope by a courier, who then rode off. The doctored photo in the envelope was meant to kick off a bit of in-character friction. How long do you think they'll last? And will they succeed? Success is filling both baskets halfway. Remember, the faster Applejack runs, the faster the belt goes. I'm going to say it now to get it out of the way... "This was MY least favorite Discord episode in the series" I guess after the Emotional CMC episode and the 2 holiday themed episodes this episode suffered for it. 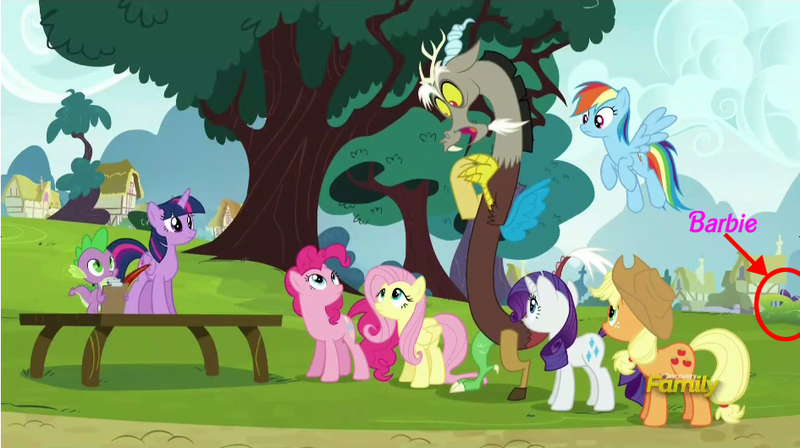 They did leave one thing hanging - but if one assumes the Mane 6 were in a giggly/freely-laughing mood, that explains it well enough. And that's why you occasionally throw in a nice one who is absolutely sincere. Heck, just throw in the occasional Twoflower character for the sake of contrast. Which works especially well if other Discworld classics have been around (like a local CMOT Dibbler), but even without them the murder-hoboes that are the main characters will probably be contrast enough.